This last week has been quite exciting. Old friends visited from Texas and, as is our custom, we headed to one of the most remote areas of the state to indulge our passion for wildlife and wild places. My choice was Arkaroola a place that I had visited many years ago on an indigenous cultures study tour and an environment I was eager to experience again. 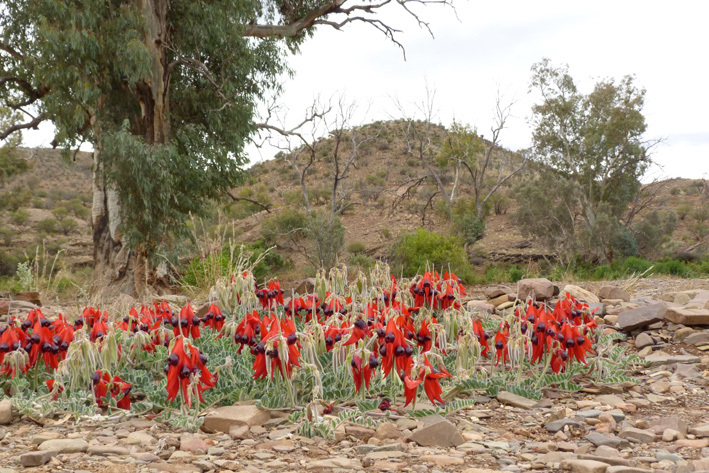 Arkaroola is a world heritage listed site in the northern Flinders Ranges 600kms north of Adelaide. 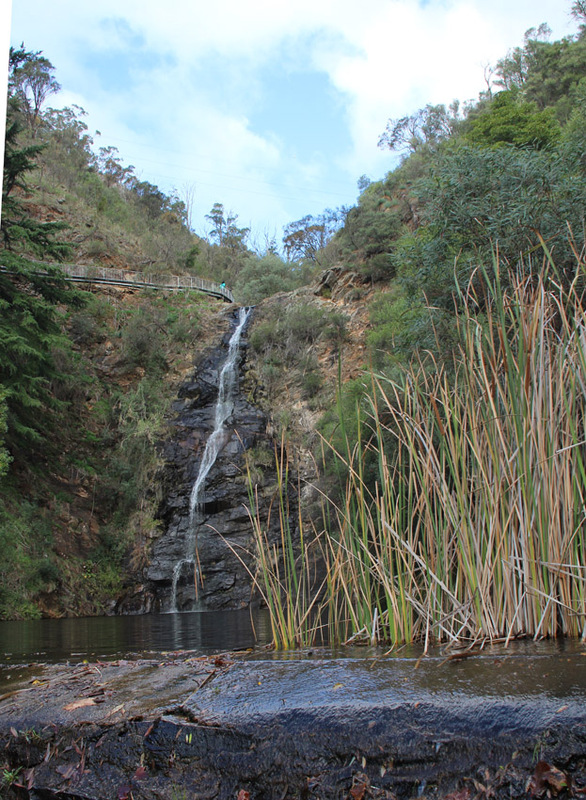 It is a landscape of harsh granite peaks and deep, enchanting gorges; a favourite haunt for off road drivers, bush walkers and naturalists. Despite its isolation, facilities at the visitor centre are first class providing accommodation, a restaurant, supplies and fuel. 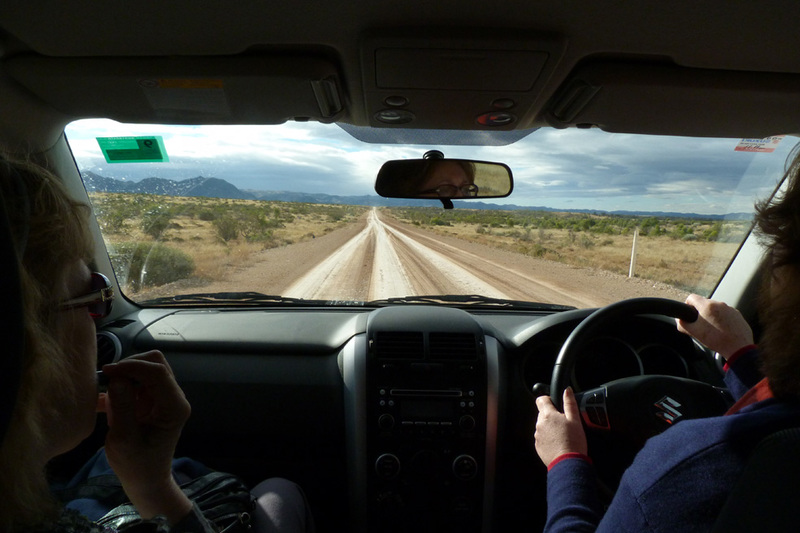 The road from Wilpena in the southern part of the ranges to Arkaroola is largely unsealed and traverses an iconic selection of Australian arid zone bushland ranging from wide brown plains and grassland to forested scrub. The road is traversed by numerous ephemeral creeks some of which wind back into interesting rocky gorges. 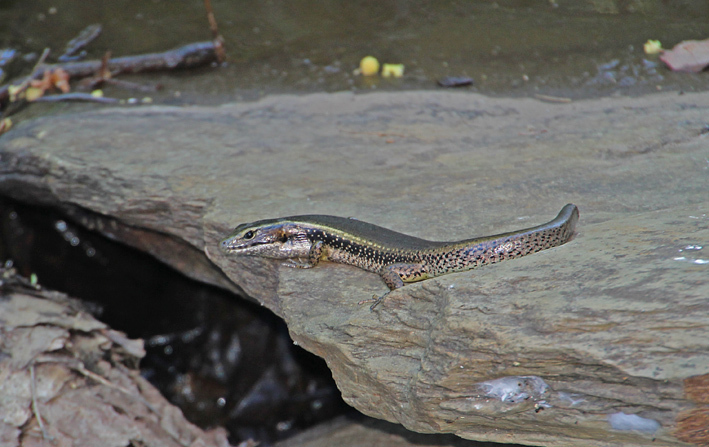 Each time I have driven this route the wildlife that I have encountered has been different; flocks of parrots and red kangaroos one year, sightings of a variety of lizards and raptors another. However, it was my last drive north that was most memorable. 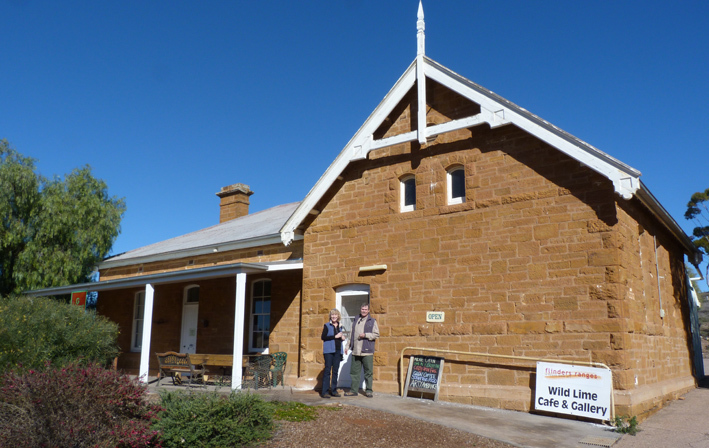 The first section of the road from the classical little outback town of Blinman with its pub, art gallery and general store, was largely uneventful. A few wedge tailed eagles soared on thermals in the distance and a couple of small flocks of corellas and galahs screeched at us as they took flight from larger eucalypts in the dry creek beds. The only kangaroos were road kill victims. Around 50 kms north of the town we drove a little way up one of the creek beds clattering over the flat rock and sand in 4WD then parked in the shade of some taller gum trees for a bite to eat. Almost immediately, a male Eeu guiding his procession of chicks, emerged from behind some bushes where they had been feeding. As we approached he sauntered off up the creek with feathery rump swaying and his little family ‘in tow’. 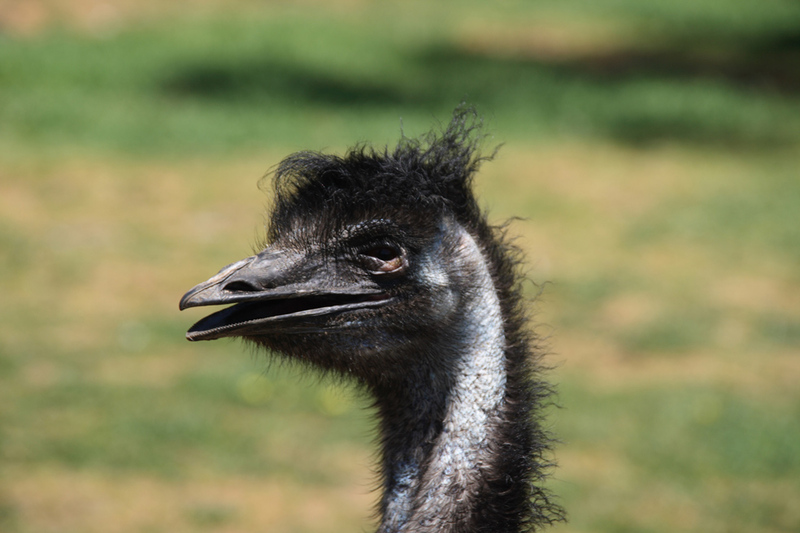 Emus are the world’s third largest bird after the African ostrich and Australasian cassowary; they grow to a height of 2 metres and can weigh almost 40 kgs. 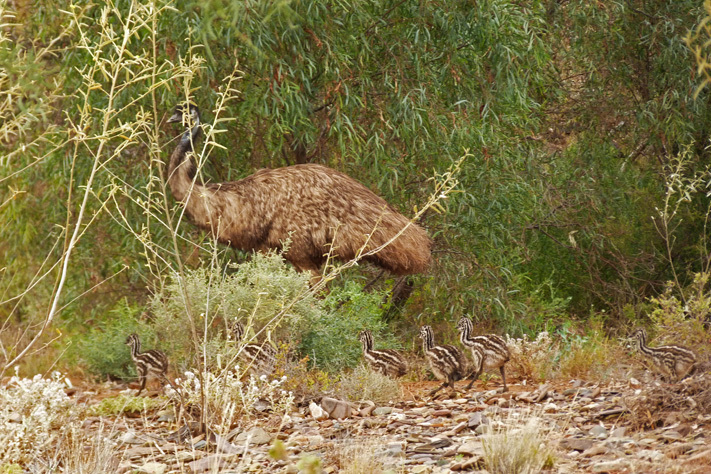 Emus run at speeds over 60 kph. This bird had to be a male as only males incubate the eggs and care for the young. This was the first of many encounters over the next few days. 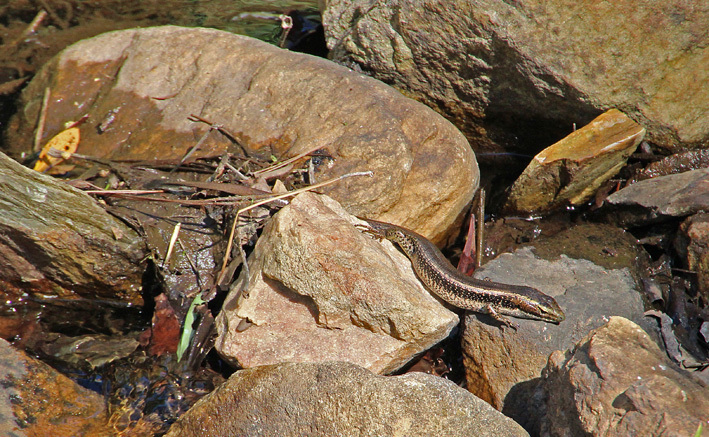 Perhaps the most unforgettable was just a few kilometres outside of Arkaroola. 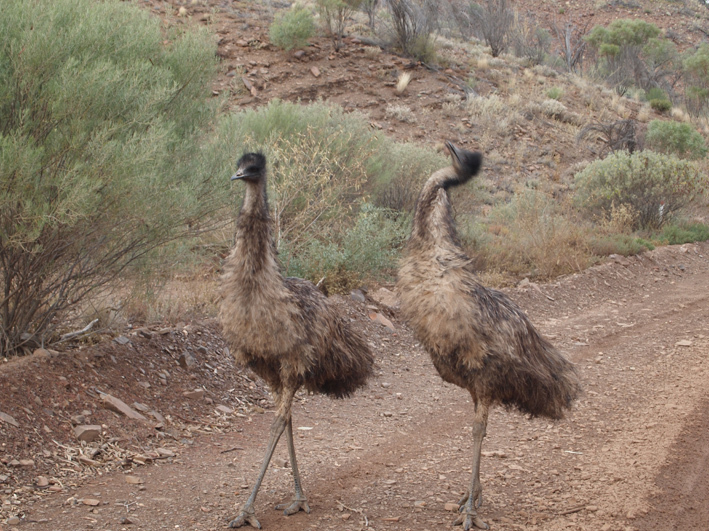 We were rounding a sharp bend in the road when a pair of emus suddenly appeared on the road hurtling towards us. The pair seemed oblivious to our presence and wholly engrossed in some kind of emu ‘high jinks’. They pushed and shoved at each other while still running, one falling sideways, rolling over then leaping into the air to continue the game. We skidded to a halt and watched them cavort privileged to see such a candid display of exuberant animal behaviour. 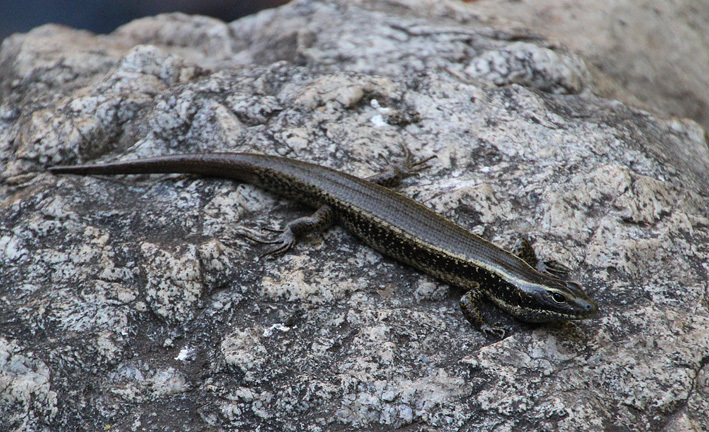 After a minute or so they settled down and wandered up a rocky together slope feeding. 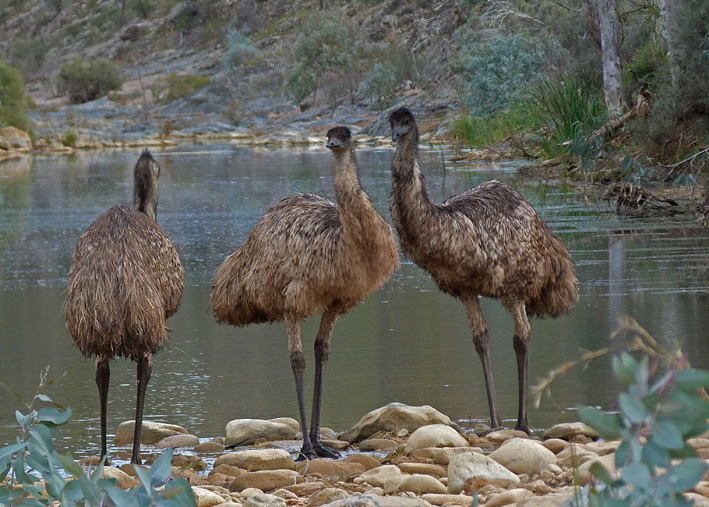 Our final emu encounter occurred near one of the few permanent waterholes in the region. Two large birds suddenly appeared from the scrub and ran alongside the vehicle for a couple of hundred metres then abruptly cut across us and headed for a stand of tall eucalypts. We pulled over and walked slowly down to the trees and watched them join up with another group and start drinking. In the soft evening light, the scene was really quite unforgettable and the Emus though aware of our presence, did not seem uncomfortable allowing us to capture some memorable images. 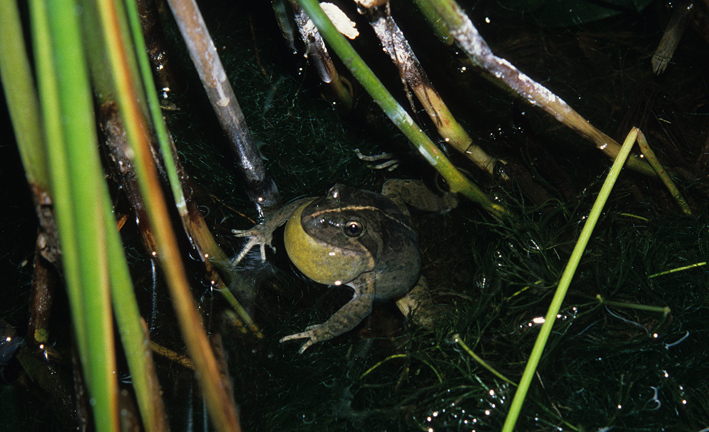 Each season in our southern state has its own natural highlights, For many March in Adelaide is a very special month; one where culture and wildlife seem to interconnect in rather unusual ways. 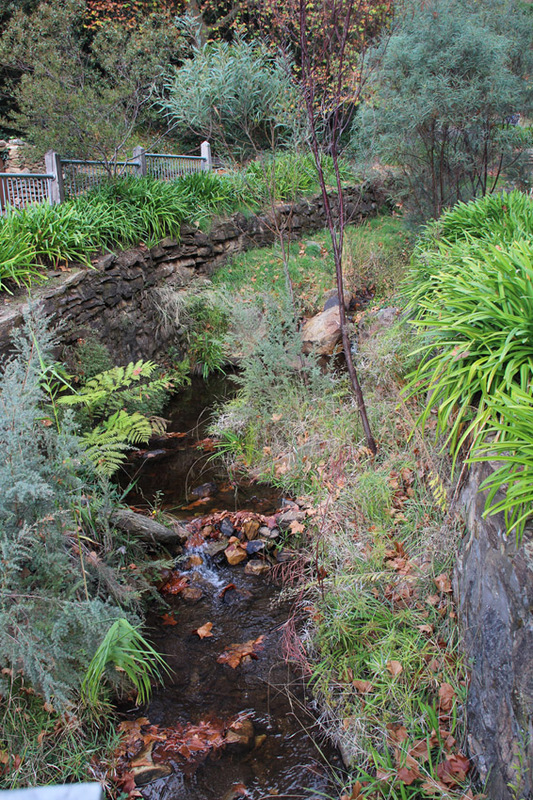 The city of Adelaide is separated from the outer suburbs by over 760 hectares of parklands. 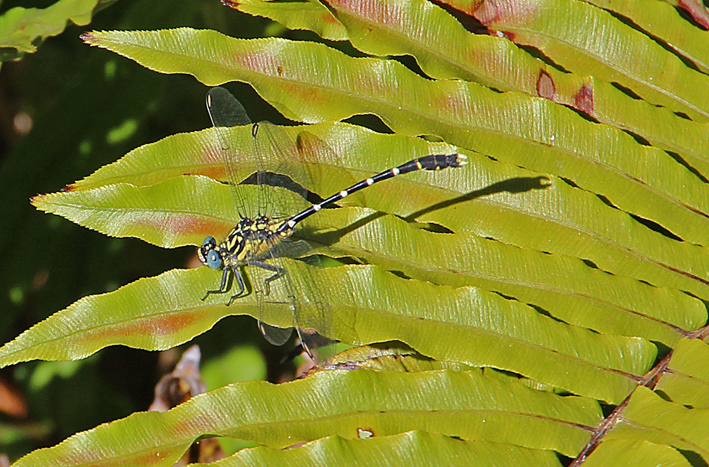 They consist of playing fields, open woodland, creeks and gardens. 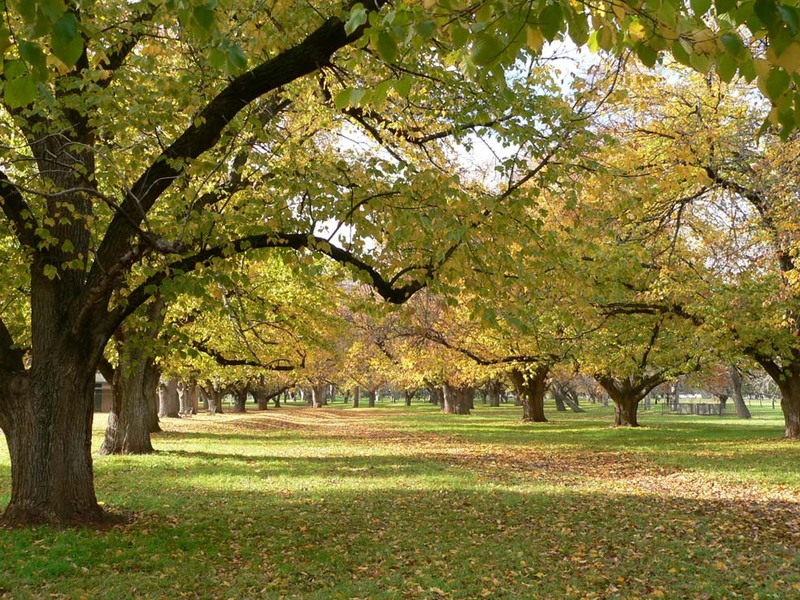 Most of the year, the parklands are frequented by joggers, cyclists and picnicking families. However, each March the serenity of the eastern parklands is replaced by the roar of V8 motors, the rhythms of international music and a surreal feast of various performing artists. 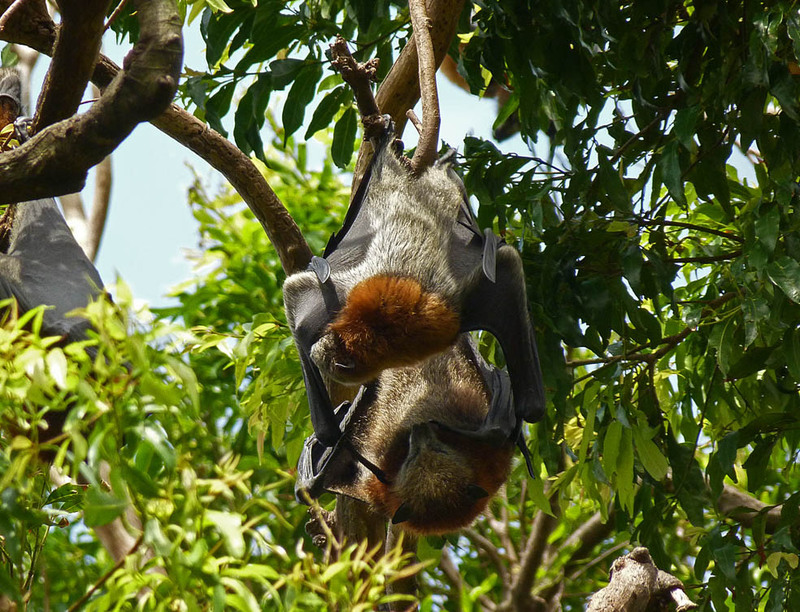 Now, you would think that such an onslaught of humanity; its sounds, lights and smells would frighten the daylights out of the parklands’ resident wildlife. Admittedly, the local birds do seem a little more nervous and the resident bat population somewhat more erratic in their coming and goings. On the other hand, the possum population seems to relish the activity. Although they are not obvious to the casual observer, when the troubadours, drivers and musicians retire for the night these masters of the nocturnal world emerge to search for the spoils of the day. Over the last few years I have enjoyed the city’s March festivities and often wandered down the east end to take in a concert, play or watch the ‘V8 Supercars’ burn up the track. 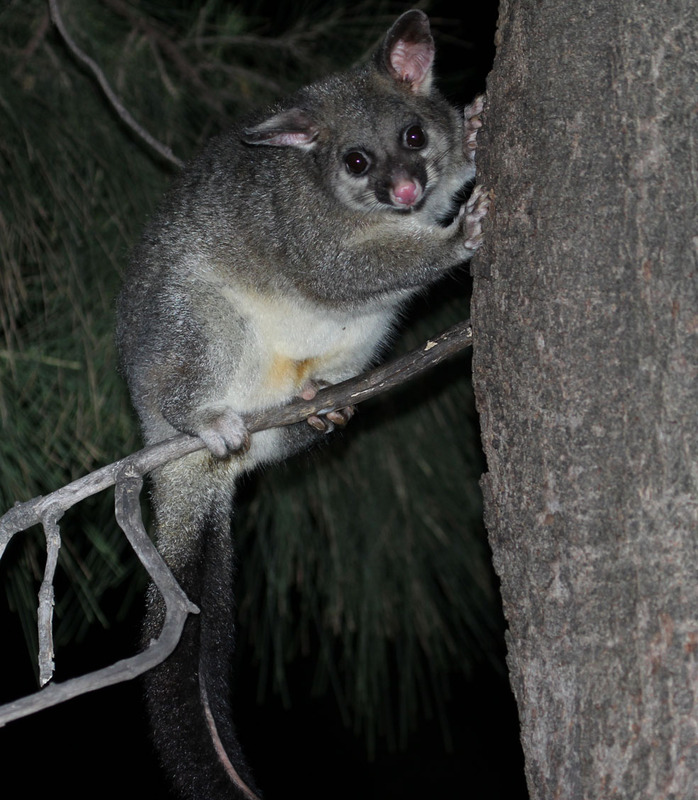 This year, I decided to walk home after a late night performance and was more than surprised to see a couple of common brushtail possums foraging near an overflowing trash can. Normally solitary, these cat sizes marsupials seemed indifferent to each other as they sought out some apple and banana leftovers, a welcome change to their usual diet of leaves, buds and native fruits. I was aware that possum numbers had generally declined throughout the state due to habitat changes and predation by feral animals, most notably cats. I watched them for a while thinking to myself that if a little party food on the side bolstered their survival chances who was I to take the purist stand on natural diets for our indigenous species. Unfortunately, I was not carrying a camera and decided to return the next evening at the unearthly hour of 4 am armed with my DSLR and long lens, in the hope of capturing a few shots. I was not disappointed. One particular animal that was sitting by the side of a trash can taking stock of the menu decided to climb up into a nearby tree as I approached. Staring defiantly at me as I adjusted the flash setting to suit the telephoto, it conveniently struck a number of typically possum-like poses then promptly disappeared into the upper branches once the modelling session had finished. I crossed to the other side of the road and scanned some native pine trees with a high powered flashlight. The stand of trees was situated just inside the perimeter fence of the aptly named ‘Garden of Unearthly Delights’, one of the festivals most notorious attractions. 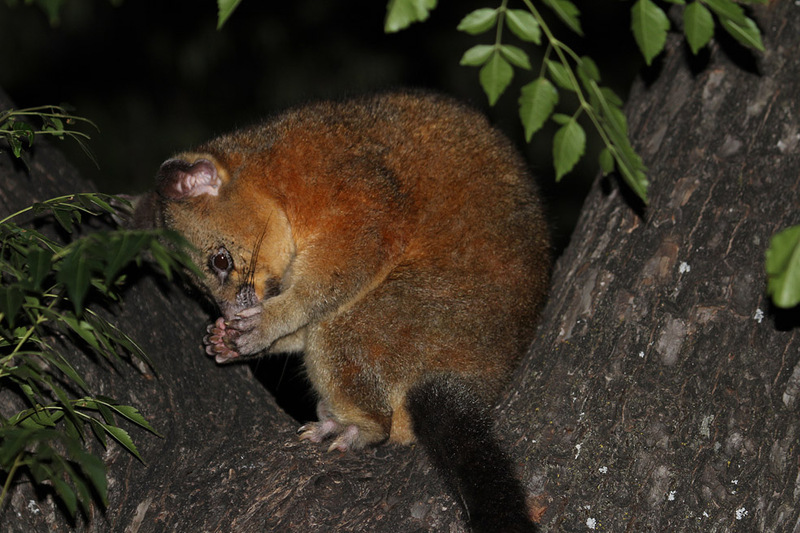 I was hoping to flush out a ringtail possum, a smaller less frequently seen species. 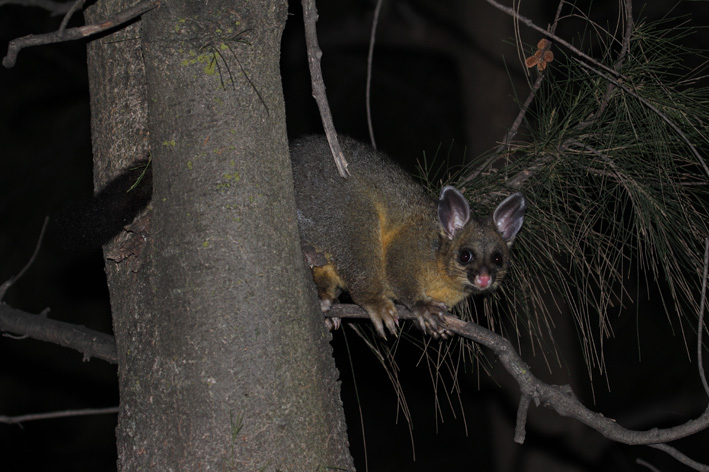 Unfortunately there were none to be found but I did manage to find a brushtail climbing the trunk of a large pine using its prehensile tail to hold on while testing the capability of a smaller branch to bear its weight. On the whole it was a successful night though I would dearly have liked to see a ringtail. Perhaps another night when sleep eludes me and the lure of the city’s indigenous nightlife beckons I’ll capture that image.